There is a dire phenomenon rising in Europe that is crippling entire societies and yet the continent sleeps, refusing not only to confront the destructive elephant in the room, but also to admit its very existence. The troubling reality being referred to is the widespread practice of Muslim inbreeding and the birth defects and social ills that it spawns. The tragic effect of the left’s control of the boundaries of debate is that any discussion about vital issues such as these marks an individual as an “Islamophobe” and a “racist.” A person who dares to point at the pathology of inbreeding in the Muslim community is accused of whipping up hatred against Muslim people. But all of this could not be further from the truth. To fight against inbreeding anywhere is to defend humanity and to defend innocent babies from birth defects. Fighting against this Islamic practice stems from a pro-Muslim calling, since identifying destructive ideologies and practices in Islam enables the protection of the Muslim people from harm. Massive inbreeding among Muslims has been going on since their prophet allowed first-cousin marriages more than 50 generations (1,400 years) ago. For many Muslims, therefore, intermarriage is regarded as being part of their religion. In many Muslim communities, it is a source of social status to marry one’s daughter or son to his or her cousin. Intermarriage also ensures that wealth is kept within the family. Islam’s strict authoritarianism plays a large role as well: keeping daughters and sons close gives families more power to control and decide their choices and lifestyles. Westerners have a historical tradition of being ready to fight and die for their country. Muslims, on the other hand, are bound together less by patriotism, but mainly by family relations and religion. Intermarrying to protect the family and community from outside non-Islamic influence is much more important to Muslims living in a Western nation than integrating into that nation and supporting it. Today, 70 percent of all Pakistanis are inbred and in Turkey the amount is between 25-30 percent (Jyllands-Posten, 27/2 2009 “More stillbirths among immigrants “). A rough estimate reveals that close to half of everybody living in the Arab world is inbred . A large percentage of the parents that are blood related come from families where intermarriage has been a tradition for generations. The BBC’s research also discovered  that while British Pakistanis accounted for just 3.4% of all births in Britain, they accounted for 30% of all British children with recessive disorders and a higher rate of infant mortality. It is not a surprise, therefore, that, in response to this evidence, a Labour Party MP has called for a ban  on first-cousin marriage. Medical evidence shows that one of the negative consequences of inbreeding is a 100 percent increase in the risk of stillbirths . One study comparing Norwegians and Pakistanis shows the risk that the child dies during labor increases by 50 percent . The risk of death due to autosomal recessive disorders — e.g., cystic fibrosis and spinal muscular atrophy — is 18 times higher. Risk of death due to malformations is 10 times higher. Mental health is also at risk: the probability of depression is higher  in communities where consanguine marriages are also high. The closer the blood relative, the higher the risk of mental and physical retardation  and schizophrenic illness . And then there are the findings on intelligence. Research shows that if one’s parents are cousins, intelligence goes down 10-16 IQ points . The risk of having an IQ lower than 70 (criterion for being “retarded”) increases 400 percent among children from cousin marriages. An academic paper  published in the Indian National Science Academy found that “the onset of various social profiles like visual fixation, social smile, sound seizures, oral expression and hand-grasping are significantly delayed among the new-born inbred babies.” Another study  found that Indian Muslim school boys whose parents were first cousins tested significantly lower than boys whose parents were unrelated in a non-verbal test on intelligence. These problems within Islam bring many detriments to Western countries. Expenses related to mentally and physically handicapped Muslim immigrants, for instance, severely drain the budgets and resources of our societies. Look at Denmark, for example: one third of the budget for the country’s schools is spent on children with special needs. Muslim children are grossly overrepresented among these children. More than half of all children  in schools for children with mental and physical handicaps in Copenhagen are foreigners — of whom Muslims are by far the largest group. One study concludes that “foreigners inbreeding costs our municipalities millions ” because of the many handicapped children and adults. What must our role be as a humanitarian society to this rising crisis? We know that the greatest concern among pregnant women and their husbands is for their child to be healthy. It is not difficult to imagine the sorrow and stress among interrelated couples who are forced to marry and pressured to have children. Is it not our duty to fight for the rights of these human beings subjected to such barbaric and inhuman predicaments? Denmark is a pioneering example of where to begin: in order to counter forced marriages, the country does not allow Danish citizens to marry foreigners younger than 24 years old. It also offers non-Western immigrants up to 15 thousand euros or 20 thousand dollars to emigrate back to their countries of origin. Immigrants who are not Danish citizens are banished from Denmark if they commit violent crimes. The state does not support families economically for having more than the country’s average amount of children. This prevents foreigners from coming to Denmark who have plans to have a lot of children and live off the state’s child support system. The country also denies resident permits to foreigners who are marrying their cousin in Denmark. Right now, the country is working on a complete halt to immigration from countries that are not oriented towards Western values (mainly Muslim countries). We must simply forbid intermarriage among first cousins. Doing so will not only help slow down all the terrible consequences of inbreeding, but also prevent Muslims who insist on practicing this damaging practice from moving to our countries. As long as we stick to facts, have a compassionate motivation, and are still able to be brave, we can be certain that not only are we right to reach out to protect Muslim people, but that in doing so we are also protecting ourselves from destroying our own basic humanistic and Western values while struggling against anti-human and aggressive practices and ideologies. 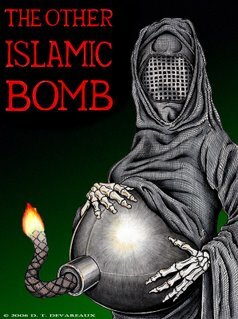 NOW I see how they get all these guys to want to be suicide bombers! They are all mentally retarded.